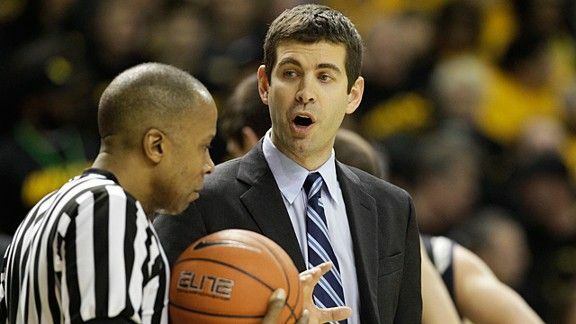 Stevens will become the NBA's youngest head coach, ahead of Jacque Vaughn. When Brad Stevens shakes hands with opponents on the court this season, he'll be greeting players his own age. Stevens was born in 1976. He's 36 years old now and will turn 37 on October 22, just a few days before the NBA season will start. One could fashion an NBA starting lineup out of active players born in 1976: Tim Duncan and Kevin Garnett in the frontcourt, Antawn Jamison the swingman and Andre Miller and Chauncey Billups in the backcourt. And there are several active players born before 1976: Ray Allen, Steve Nash and Derek Fisher to name a few. Stevens will likely have more NBA players near his age than NBA coaches. Stevens will become the NBA's youngest active head coach, ahead of Jacque Vaughn (age 38) and David Joerger (age 39). All other NBA coaches are in their 40s or above. It's easy to make the Stevens connection to the Boston Celtics' hiring of Rick Pitino in 1997. And there are some similarities: Pitino had a .734 winning percentage as a Division I coach with two appearances in the NCAA championship game. Stevens has a .772 winning percentage and also has a pair of title game appearances. But Pitino had two full seasons of NBA experience under his belt, coaching the New York Knicks in 1987-88 and 1988-89. And he had 16 seasons as a Division I head coach when he was hired by the Celtics. Stevens has six. The closer comparison might be Pitino when he was hired by the Knicks. Pitino was 35 years old and had seven years of Division I experience. Stevens is 36 with six years of Division I experience. A head coach without previous NBA head coaching experience hasn't been a barrier for the Celtics. Of their last seven head coaching hires not counting interim coaches, five of them have been first-time head coaches. The only exceptions were Pitino, who previously coached the Knicks, and Doc Rivers, who previously coached the Orlando Magic.